As working professionals, we may not get the same organized costumes parades and festivals that children do, but there is no reason we can’t also have fun in the workplace! Halloween is right around the corner and a fantastic venue to bring joy and teamwork into your atmosphere. Wear a costume: Go solo or team up with coworkers to transform yourself into whatever your imagination desires. Decorate your workspace: Whether it be the entire building or just your desk, bring some Halloween fun to your workday by bringing in some decorations from home. Plan an activity: Bob for apples or organize a costume contest. Carving/painting pumpkins is a great way to have some fun, while adding festive décor to your office by displaying your creations! Bring in the food: Nothing brings people together like a table filled with baked foods – and what better theme than Fall and Halloween?! Let the candy flow: What is Halloween without a treat? Skip the tricks and bring in a bag of assorted candy. Your team will thank you, and so will your taste buds. Run any ideas by management beforehand so that you do not break any corporate rules or disrupt the productivity of others. Include everyone, but do not demand participation. It is not abnormal to come across people that choose not to celebrate Halloween – and that’s okay! Let them know that they are invited but do not make participation mandatory. Keep everything in good taste. Remember that you are still in a professional setting and to dress as such. Avoid costumes that could be considered offensive, distracting or inappropriate. Doublecheck that your plans do not interfere with the safety of your workplace. Flowing or loose fabrics should not be worn around machinery and glitter falling from your tiara will likely land (and stick) to every surface you come within 5 feet of. When celebrating this Halloween in your workplace, be sure to have fun, stay safe, and enjoy celebrating as a team! 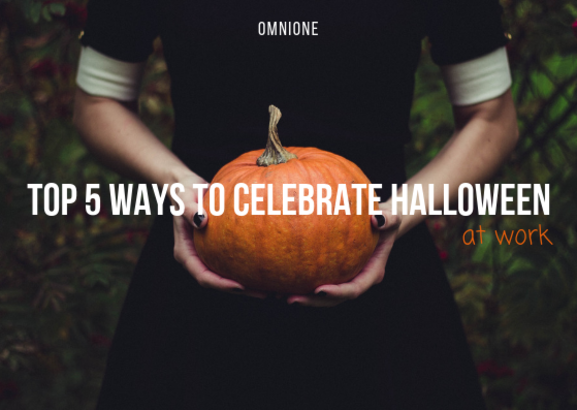 Happy Halloween from your friends at Omni One!